Tolland Town Hall is located at 21 Tolland Green, Tolland CT 06084; phone: 860-871-3600. Photo: John Cady House, ca. 1720, 484 Mile Hill Road, Tolland, CT. Listed on the National Register of Historic Places in 1982. Photograph by User:Magicpiano (own work), 2012, [cc-by-3.0 (creativecommons.org/licenses/by/3.0)], via Wikimedia Commons, accessed March, 2014. Tolland was incorporated in 1715, the name being taken from Tolland in the English county of Somerset. Tolland was originally part of Windsor (Hartford County). Records of early landowners include the names: Samuel Pinney, Jr., Hezekiah Porter, Sergeant Henry Wolcott, Joseph Porter, Nathan Gillett, Samuel Forward, Enoch Loomis, Cornelius Brige, Simon Wolcott, Jr., Noah Grant, Joshua Loomis, Thomas Grant, Joseph Rockwell Jr., and Josiah Rockwell. The first town clerk and selectmen were chosen in 1717. 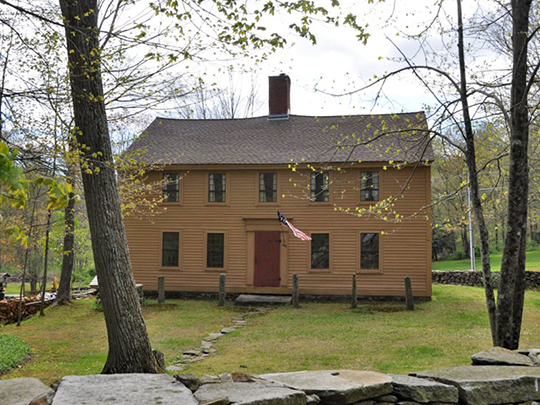 In 1719 the town proprietors voted to build a meeting house. Reverend Stephen Steel is believed to have been the first minister, who served until 1758. The first post office was established about 1796 with Deacon Benoni Shepard, a tavern keeper, appointed as the first postmaster. The first census had been taken about 1756 at which time the number of inhabitants was found to be 917. Loren P. Waldo, President, Tolland County Historical Society, The Early History of Tolland, Case, Lockwood & Company, Hartford, 1861.